What you get is what you get… in this case, not even an image of the species, but merely an image of the holotype of the species, which will have to do (and not even the ENTIRE holotype at that! …. not my fault… I have asked JSTOR Plants to make it easier for paying users such as myself to download high rez images of complete specimens…but so far I am told “it is not possible”). In any case, consider yourself lucky to have even come this far. Ruellia carnea is a magnificent species that is one of many Acanthaceae that are endemic to the small Yemenese island of Socotra. Based on its stellate trichomes that paint the young leaves white, Ruellia carnea seems clearly allied to Ruellia nocturna and Ruellia discifolia, both of which are white-flowered, and night blooming compared to this red-flowered and day-blooming species. 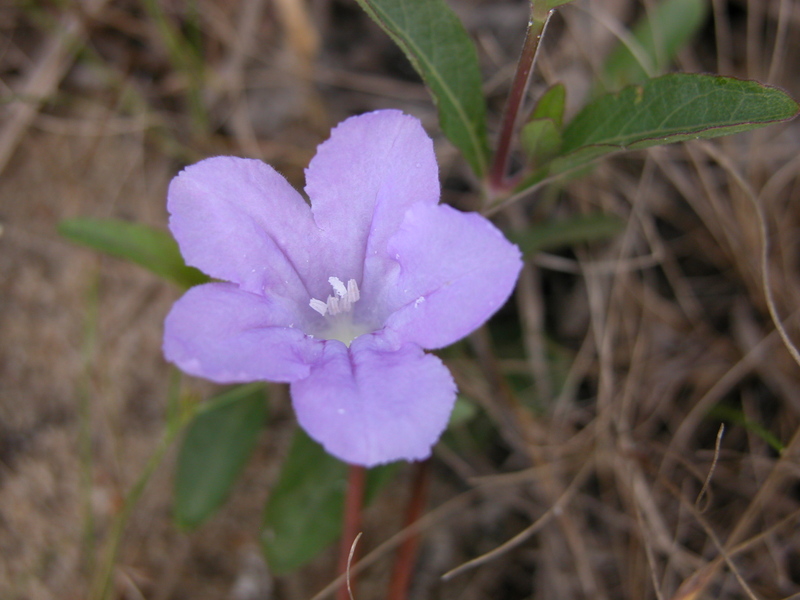 Other species in this phylogenetic neighborhood have similarly shaped and vestitured leaves, such as Ruellia bignoniiflora. If you have plans to travel to Socotra anytime in the next 50 years, please: TAKE ME WITH YOU. Photograph of the holotype, G. Schweinfurth 714, Kew. Despite the epithet, this plant doesn’t actually occur natively in California. Well, at least not the US version of California. This is a Mexican endemic, a Baja specialty, and a phylogenetic nightmare (unstable… perhaps of hybrid origin). Difficult on the inside, beautiful on the outside. Sink it in your yard for sure. A common species of a large chunk of tropical South America. Widespread. Emblematic of the pedunculate species in the “Physiruellia” clade. In the second photo, note the woody capsule (fruit) with modified funiculi (hooks) that aid in seed dispersal when the fruit explodes, as all Acanths in the proper sense do. Ruellia breedlovei was named in honor of Dennis Breedlove (by our colleague Tom Daniel) for his many thousands of contributions to understanding the Mexican flora. Dennis was one of the great collectors of the botany of Mexico and worked long hours to understand, in particular, the flora of the highlands of Chiapas. After years (now decades–I’m getting old) of international fieldwork to remote corners on various continents, Mexico remains one of my favorite places on this great planet: to be sure, among the most fascinating biologically, geologically, and culturally. Friendly people, foods, salsas, and native plants: life rarely improves and minimally achieves a more sophisticated state. If you are an American and haven’t been to Mexico: DON’T WASTE ANOTHER MOMENT–RUN, DON’T WALK. (And, while in Chiapas, be sure to check out the market in San Cristóbal (probably the coolest culinary experience of my life) followed by Cascadas de Agua Azul (don’t miss Ruellia maya and Ruellia jussieuoides at the latter, both of which grow along the margins of these spectacular cascades). Update (Jan 2016): Manuel, Amanda, and I were so fortunate to find Ruellia breedlovei in the field, in its native habitat. It is hot, in more ways than one. I am really fond of this species.